And how to hack them to fit your goals. Everyone’s jumping up and down because now it’s fall and “pumpkin foods” are everywhere. Personally… we’re terrified. Sure, these pumpkin covered pumpkin-whatevers are goddamn delicious, but that’s only because most of them are sugar-coated carbs (topped with fat). Let’s get real: “pumpkin season” isn’t really “pumpkin” season; it’s more like “pumpkin-flavored” season. Combine this tempting autumn addiction with bulking season and we’re all in trouble. But just because you’re counting macros doesn’t mean you have to sit out of the whole pumpkin-party. In fact, you can hack most of these autumn essentials with a little bit of protein ingenuity. Your friends will never know the difference. It’s far better to blow their minds than their guts. Pumpkin spice? It’s more like the Predominantly Sugar Latte. One grande helping of this infamous sugar concoction packs 48 carbs, 46 grams of which are actually sugar (don’t even ask about the venti). Keep sipping those down and you’ll be smiling like a Jack-O-Lantern, alright (missing teeth and all). Skip standing in line like a sheep and make your own homemade PROTEIN pumpkin latte instead. Good luck trying to keep one of these off the dessert table. Compelling as the taste may be, you’re also staring down the barrel of damn near 70 carbs per eight-ounce slice. Add 47 grams of fat to that and you’re looking at 740 calories!!! You’ll need a hell of a recipe to replace this obligatory fall order… so you’re lucky we’ve got one right here. How good is it, exactly? Well, it’s pumpkin flavored cheesecake, but with 20 grams of protein in each slice and only seven grams of net carbs. THAT’S ONE TENTH THE CARBS! “Whoa whoa whoa! You’re coming for my bars, now? !” No… we like bars… scratch that, we LOVE them -- but only the best ones. There’s a major bar brand re-releasing their line of seasonal flavors, including their own spiced spin on pumpkin, but one look at the nutrition label and you’ll find only eight grams of SOY protein at the cost of 45 grams of carbs. But this year you’ve got another option. 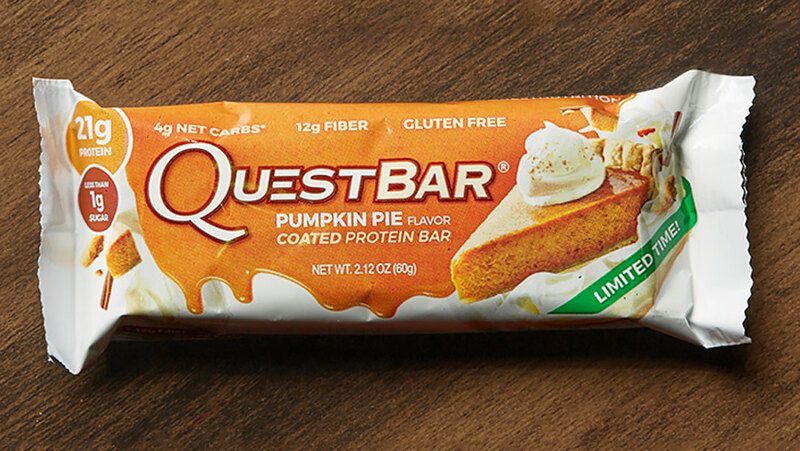 The new Pumpkin Pie Quest Bar is a special dream baby hybrid of perfect pumpkin flavor and untouchable macros. It has 21 grams of whey and milk protein isolates; virtually zero sugar, and only four grams of net carbs. Whatever your goals may be, this one fits the bill. OK, this one goes without saying. Maybe ice cream isn’t the worst thing on this list, but the extra 40 carbs per cup certainly aren’t progressing you either! If you’ve got an ice cream machine though, you’re probably already addicted. We’re not trying to cut off those taste buds entirely, but maybe we can refine them. Or better yet, trick them! Try a bowl of this PROTEIN Pumpkin Ice Cream and you’ll never know the difference, except for a quarter of the carbs and five times the protein! Tell me if this sounds familiar: being rung up at the coffee house cashier for a Pumpkin Sugar Latte (just kidding, you know better) and you’re suckered into an impulse buy: a non-threatening pumpkin muffin, or slice of pumpkin bread… it can’t be that bad for you, right? WRONG: 39 grams of sugar, 63 grams of carbs, and one full dump truck of absolute junk. Maybe you’d prefer the smarter recipe instead, the one with 11 grams of protein and only four grams of net carbs?